I have had many people contact me about shipping machines and how things should be done. I would highly recommend before buying any machine from anyone, make sure they are a reputable seller and if you are buying from eBay, they should have good feedback. As you know these machines are old (10, 20, 30+ years) and stuff gets knocked around and sometimes they get very damaged during shipping. I can honestly tell you, 8/10 machines I have had shipped to me have shown up NOT WORKING and/or have many problems. Not caused by seller, but shipping. Its frustrating for people sometimes (especially newbs), but its the way it works. 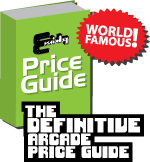 Q: Who ships Arcade/Pinball Machines at reasonable prices? A: BAX Global (you must open an account), game must be cardboarded and strapped to a pallet. Forward Air , game must be cardboarded or crated, strapped to a pallet. NAVL, North American Van Lines / STI - Contact Michelle Bianchi (mbianchi@precision-nal.com)- Game broker. They pick up the game as-is, shrink and blanket the game. I will add more in the near future. Q: When I received the game, it wasnt as described. Broken parts, Broken corner, etc. What should I do? A: Always ask for pictures of the game you are purchasing.. Front, sides, control panel, inside and to see the game ON and WORKING. THIS ISNT JUST FOR YOU, BUT USEFUL FOR INSURANCE PURPOSES ALSO! You need to make sure you are getting exactly what you purchased. So this is extremely important. Q: I saw the game working in the pictures, but its not working now! Im pissed! Whats should I do? A: If you saw the game working and now its not, there is nothing to be pissed about. The game is OLD, remember that! Stuff gets knocked around. So I always recommend before plugging the game in, to open the game and make sure everything is still connected. Reseat the chips by pushing on them. Make sure of this! As I stated before 8/10 of the machines Ive purchased on-line have come D E A D or with MAJOR PROBLEMS. You should email the seller and ask for help, or post for help on the RGVAC (Rec.Games.Video.Arcade.Collecting newsgoup) or the KLOV FORUM. Q: Hey BRO! The game came with no keys!, Locks!, etc? Q: How do I ship an arcade machine? First I make sure I send pictures of the actual machine being shipped. This is for my safety and the buyers safety. Make sure he's getting exactly what he paid for, so there isnt any questions once its received. Then I make sure all the boards, including the monitor boards are properly secured. I cardboard or just shrinkwrap the game depending on the shipper. If I need to strap and pallet the machine, then I get a pallet (normally get one from behind Lowes or Home Depot). then put the game on the pallet. Buy the straps from Lowes/Home depot (the 4 pack) for around $20. I use 2 straps. One from the back to the front of the cab. Then the second from side to side. Q: How do I prepare a pinball machine for shipping? A: I have shipped tons of pinball machines and as you know, these have tons of moving parts and tons of little things than can go wrong with them. So more than likely, you WILL have to do some tweaking on them once they arrive. First I remove all the balls from the game and put them in the coin box. Remove the coin box and manuals. Make sure all the boards are securely mounted to the head, check inside the machine for any loose parts. Put some cardboard (blanket or something) on the glass and bring the head down and shrink or strap it down. Remove the head latch (if it has one) and put it in the coin box. Shrink all the legs together & put the bolts in there with them or in the coin box. Then I place the legs on the pinball machine and the coin box also. I normally put cardboard around the pinball machines and shrink wrap it. Q: My machine arrived damaged! What should I do? A: One thing I really recommend, before accepting the machine. Make sure you do a once over. So walk around the machine, look at it closely before signing the papers and accepting the machine. Lets say you have already accepted the machine. You need to take pix of the damage and contact the shipper and the shipping company. Email them the before and after pix and start the claim process almost immediately. I know that if you take a week or two, the shipping company will no longer honour the insurance.